I think you underestimate the effect of moving the orange line. The Thompson Sq stop was surrounded by dense residential on all 4 sides. The CC just barely skirts Charlestown at all. I'm not saying the El shouldn't have come down, but most of Charlestown (like most of Southie) feels underserved by rail transit. That may be more psychological because of Rutherford Ave.'s width than distance-related. CC is right bloody there...you can see the T logo from Thompson Sq. and the CC overpass is right next to the intersection (although probably not signed well enough as a preferred access point from the Thompson side into the station). Improve Rutherford/Austin when Rutherford gets put on its road diet and either widen this sidewalk or fork another Austin St.-leaning incline onto the existing footramp setup, stick a T sign at the footbridge so people know they don't have to cross the street, and it's fine. The El just skipped over all the density on Main St. out to Sullivan with an unusually long gap when an intermediate in the present-day vicinity of Edwards Playground was probably warranted. They didn't do it because the Green Line branch was still running underneath the El all that time making stops on every corner. And the second GL branch running down Chelsea and Bunker Hill St.'s. But that's a 92/93 bus problem. If the frequencies are too lousy (they are), increase them. It's a pretty crisp 11-minute trip to Sullivan from the Financial District on the 92, 22 mins. when the 92 gets extended at peak to loop around all of Assembly, and 15 minutes on the 93. But the headways are woeful: unnaturally short peak periods of 15 min. frequencies that don't even span the whole traditional rush hour, then off-peak of a meh 20 mins. on the 93 and a horrible 35-40 mins. on the 92. There's your problem. The 92 has no business running that infrequently at all, and the 93's frequencies aren't keeping up with the times around the Navy Yard redevelopment. One is an outright max-priority transit equity fix, the other is a matter of unfreezing frequencies that have been static for 30 years and are probably minimally adequate for Bunker Hill St...but really haven't tracked with escalating demand around City Sq./Navy Yard/Spalding. This isn't a rail transit problem. It's a problem of a high-ridership, high- neighborhood dependency bus running half as often as they need to. With the quite good travel times those routes have you don't even need to do much in the way of Key Bus Improvements things on this route like signal priority, stop consolidation, or reshaping. They're pretty good as-is. Just up the frequencies to something less embarrassing and the whole Main St. corridor gets better transit than it's had at any point since the 92's Green Line branch was bustituted 66 years ago. And City Sq./Navy Yard gets its transit cavity filled in commensurate with the development cavity being filled in. Some neighborhood transit inequities have no rail or BRT tactical nuclear strike angle to them. This is one of those. The whole of the neighborhood is packed into barely 1 square mile and is a dozen minutes or less every direction to every transit transfer in the land. I would argue it harms the neighborhood more to stray focus away from purely local bus service enhancements exploiting those naturally fast travel times to the hilt. The more you demand shiny things for shiny things' sake the less frequently the 92 and 93 are going to run. Frequencies are the showcase for the neighborhood, not shiny things. Agreed about the buses. I've often felt that the curiously out-of-place car-centrism of people living in a colonial neighborhood like Charlestown has had mostly to do with the crumminess of the service provided. They feel cut off by the big road infrastructure around them, the water, and the T hasn't really helped at all. It also hasn't helped that Breed's Hill and Bunker Hill form a natural barrier between the 92 and 93 (the route is literally 4 -5 blocks from each other) but walking between them feels like a journey in itself. Also weather plays a large role in making the trips a headache, especially for the 93. Why would they over design a bridge for something that won't happen? The state doesn't even have the money to build a new bridge as it is, why spend more?! A logical corridor for a future LRV line includes the RKG, the North Washington Bridge, and a future Tobin Bridge replacement (or a parallel street-level drawbridge). This LRV line would provide community connectivity between Chelsea, Charlestown and downtown Boston, something the commuter rail line does not. The North Washington Bridge replacement project is an opportunity (at relatively low additional cost) to put into place a key component of that potential LRV corridor. RKG should only have LRV if it takes an existing traffic lane. I cannot stand the way transportation planning assumes that every time they see a green space it is meant to be tracked or paved. That would be the only way it would happen. It would cost more to rip up the designed RKG for a RoW than laying track on the arterials. Yup. And you don't have to make any design changes to the road to drop in pavement rails later. If it's built to handle modern truck loads, it's built to handle trainlining LRV's. Sizeable water crossings like this don't have double-parkers, parallel parkers, traffic lights every 200 ft., and darting cross-traffic; a trolley will not get stuck in traffic on that bridge if it's hanging a right onto Chelsea or Water St. the second it touches down in Charlestown. If MassDOT insists on overbuilding every asphalt slab to a capacity extreme, it's not like the bridge ain't big enough for the both of 'em when there's 4 travel lanes and bike lanes on both sides. I think it's overthinking to an extreme to demand expensive design changes today for an LRT branch we only have a fuzzy napkin-sketch idea how would differentiate from a readily-improvable 93 bus, and which doesn't crack the Top 8 or 9 most urgent rapid transit projects inside the borders of City of Boston. Streetcars...what are they designed for again? 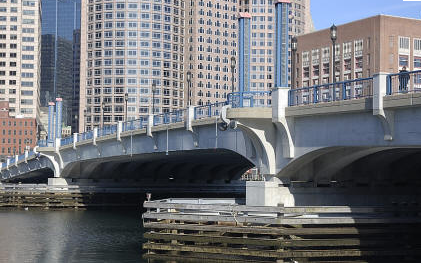 If you want an analogous span, look to the Summer St. Bridge between Seaport and Southie. Gratuitously overbuilt in 2000 with every feature under the sun (including a boat ramp), 4 useless lanes over over-capacity when the road mashes back to 2 on touchdown into Southie, capacity so exceeds volumes that it's little more than a dragstrip between Drydock Ave. and E. 1st St. Get the Green Line into the Transitway and there's your Southie neighborhood branch. Tracks-on-pavement over the Summer St. span will run faster than the B Line's supposed grade separation. Street-running's not evil if you pick your spots. I can't imagine N. Washington's volumes on this supersize span are going to be the same they are today after Rutherford Ave. goes on its diet. It's not nearly as busy now as it was 10 years ago because the Big Dig removed a lot of the Rutherford induced demand. A 4-lane bridge in the Rutherford road diet era is probably going to end up with just as much slack capacity as the Summer St. dragstrip. There may be some confusion about what I meant about designing the new N. Washington Street Bridge to accommodate a future light rail line. I did not mean make the bridge wider. I only meant make it strong enough for light rail cars, which I don't think would add a significant cost. Does a typical LRV consist weigh much more than a fully loaded tractor trailer? I feel like most modern bridges should be able to accommodate light rail with the only modification needed being to lay tracks, but I could be way off. Weight limits vary by state, but it looks like 99k is the max you'd see on Massachusetts roads. Green Line cars are about 85-87k depending on the car, crush loads off 270 passengers x 160 lbs/passenger adds 43k, so you're looking at about 130k load total. If you're building it to handle the occasional overweight truck, then one-car trains wouldn't be a problem. Summer St. I know is overbuilt because that's the truck route to Conley Terminal container port. It's a reliable supposition that the replacement N. Washington bridge is going to be built as strong as the existing one originally was, if for no other reason than the abutment spacing will have to be more or less the same. This bridge took 4-car Orange Line trains at MUCH higher frequencies than today because of the Atlantic Ave. El branching in addition to 2 Green Line branches on the surface which ran at peak hours of the day with 2-car PCC's due to having to serve subway ridership. In the WWII/postwar era you could have two 4-car OL trains passing each other, and up to four 2-car GL trains passing each other on converging branch headways...with rush hour traffic in the peak pre-interstate era when the state was designing the Artery to alleviate jams here...in wartime when heavy trucking to/from the Navy Yard was an all-day thing and when trucking to industries on the wharves were near peak. I am pretty sure that unless they design a bridge intentionally lower-load than the old...which they aren't because MassDOT never designs any replacement that isn't a 1:1 match or more for capacity...that this is a non-issue not worth worrying about. 3-car LRV's on relatively light headways are a lot less than the transit that used to cross here all-day/every-day. Traffic volumes are lower than they used to be, and will decline further with the Rutherford road diet. Heavy trucking has more or less disappeared entirely from what used to run beside those trolleys and under those El cars. Nothing above-and-beyond has to be pre-provisioned to avoid ruining a future transit corridor. If the bridge is built to the same capacity as the old, they don't have to do anything +1 more. It's provisioned. I would be far more nervous about what another MassDOT capacity overdose does to ped/bike/Freedom Trail access to Charlestown and failing to encourage more of that access than I would ever be about speculative rail transit 30 years from now or whether the damn thing is going to be built strong enough. MassDOT never adjusts down, and it doesn't look like they're doing that here either. Does anyone know when the N Washington Bridge last opened? Had its controls deactivated/removed? When the natural gas pipeline was tacked on along the underside? When the other utility (water main???) was laid along the sidewalk on the northbound side? Last edited by Charlie_mta; 09-14-2014 at 12:30 AM. At first I thought you had to cross over three lanes of what looks like highway speed traffic to get on to the Ferris Wheel. Now I see the carriages dip under the decking. Clever. Clever in the design shown, but in Boston we'll make you cross the traffic. We'd have the Freedom Trail cross the street in the middle of the bridge. There would be a paste on brick/stone line for the Freedom Trail leading across all six lanes to and from the Ferris Wheel. And if you ask nicely the DOT will give the pedestrians a blinking light (but not one that changes). 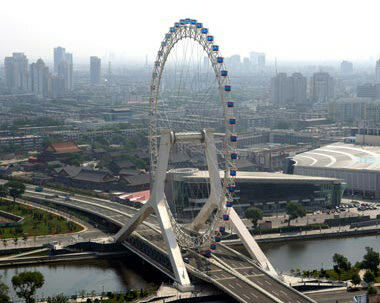 Anybody else fully expecting an undistinguished over-water highway viaduct like this one?